Here are links to things that make a household run cleaner & healthier, on the cheap, and on the green. I like to be helpful, and I think this page will accomplish that. 1001 uses for white distilled vinegar has separate cooking, cleaning, and health pages for white vinegar, so be sure to check all of them! amazing product! 51 uses for baking soda. Love me some baking soda. Again, for cooking, cleaning, and health. Crunch Betty blog has a DIY recipe for so many cleaning and personal care products! Her blog is worth visiting, and staying for a while. Do a search if you are looking for a particular product. Natural SUNSCREEN reviews from KitchenStewardship and another post from Everyday Paleo that is more food & supplement related. And an OE post about how healthy eating is changing my skin’s ability to tan along with a link to Dr. Axe article about how most sunscreen is toxic. I posted a link to How To Store Fruits and Vegetables to keep them from spoiling, which is important when you’re trying to buy and eat more of them! And, it’s printable! The DIY Natural website is very helpful with many diy cleaning recipes, especially the laundry and dishwasher recipes. They do recommend Borax, as many sites do, but as of June 2013, it has received an “F” from the Environment Working Group, so I cannot personally recommend Borax any longer until I get new information. Here is a picture I posted on Instagram for a homemade furniture polish I found (all over the internet). Try it! 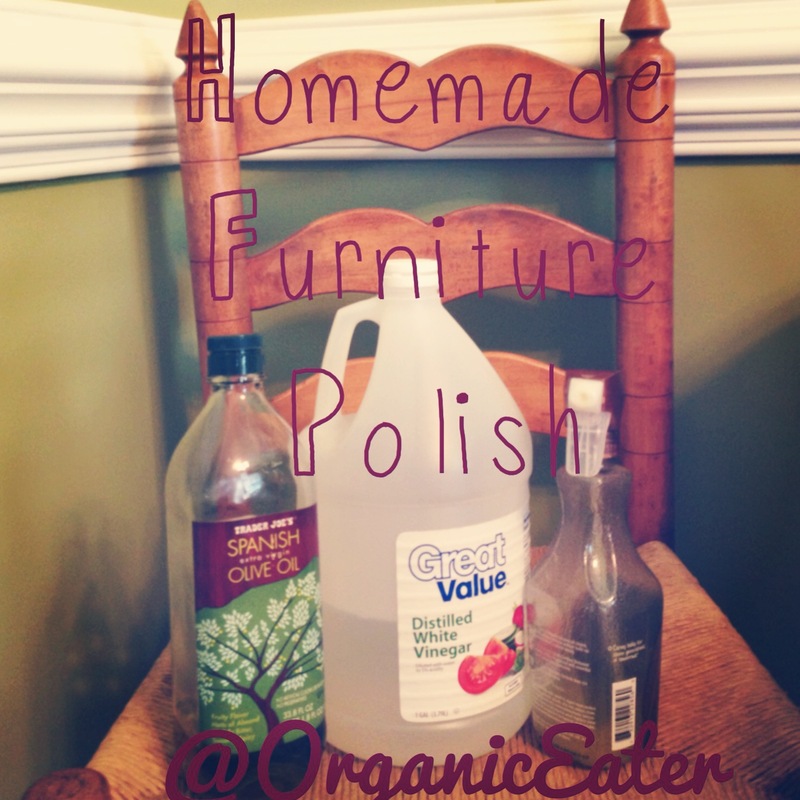 It’s so easy, and so cheap compared to other “healthy” furniture polish I have found. Make small batches of this as you need it, so it won’t “go bad” before you use it all. I usually only make about 4 Tablespoons. Directions: Equal parts olive oil (I used a Trader Joes brand that I did not love the taste of, so now it’s used for this instead) and water OR vinegar. I prefer vinegar because I feel like there’s some cleaning power in it and the smell evaporates quickly, so it’s not gonna stink up your house. IF you want this to smell great, just add some essential oil (a couple drops is probably sufficient). Adding tea tree oil (there are other oils to choose from too) can disinfect, if you need that. See, easy! Now go dust!